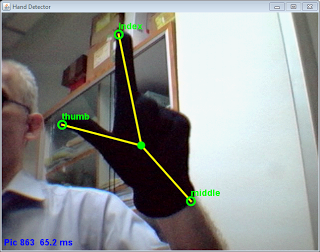 This post is part of a series on Natural User Interfaces (NUIs) published by Dr. Andrew Davison and deals with detecting hands from a webcam video feed using JavaCV. 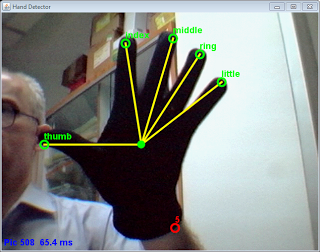 The colored blob detection code of chapter 5 (available at http://fivedots.coe.psu.ac.th/~ad/jg/nui05/) can be used as the basis of other shape analyzers, which I’ll illustrate here by extending it to detect a hand and fingers. In Figure 1, I’m wearing a black glove on my left hand. My Handy application attempts to find and label the thumb, index, middle, ring, and little finger. Yellow lines are drawn between the fingertips and the center-of-gravity (COG) of the hand. Figure 1. Detecting a Left Hand and Fingers. I utilized the HSVSelector application of chapter 5 to determine suitable HSV ranges for the black glove. These ranges are loaded by Handy prior to executing the steps shown in Figure 2 to obtain the hand’s contour, its COG, and orientation relative to the horizontal. Figure 2. Finding the Hand Contour. The various stages in Figure 2 are almost identical to those carried out by the ColorRectDetector.findRect() method in section 4.1 of chapter 5. However, Handy continues processing, employing a convex hull and convexity defects to locate and label the fingertips within the hand contour. These additional steps are shown in Figure 3. Figure 3. Finding and Labeling Fingertips. The hull and defects are obtained from the contour with standard OpenCV operations, which I’ll explain below. However, the final step of naming the fingers utilizes a rather hacky strategy that assumes the contour’s defects are for an out-stretched left hand. The thumb and index finger are located based on their angular position relative to the COG, and the other fingers are identified based on their position relative to those fingers. This process is rather fragile, and can easily become confused, as shown in Figure 4. Figure 4. A Misidentified Middle Finger. Nevertheless, the technique is fairly reliable, usually identifying at least the thumb and index finger irrespective of the hand’s orientation, which should be enough for basic gesture processing. However, the application doesn’t identify gestures, which will hopefully be the subject of a later chapter. Class diagrams for Handy are shown in Figure 5, with only the public methods listed. Figure 5. Class Diagrams for Handy. The top-levels of Handy parallel those of the BlobsDrumming application in chapter 5 (e.g. see chapter 5’s Figure 11), with the Handy class managing the JFrame and HandPanel displaying the annotated webcam image. 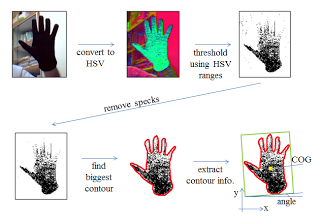 The image analyses summarized in Figures 2 and 3 are performed by the HandDetector class, which is passed the current webcam snap via a call to update(). It draws the current labeled fingertips, COG, and connecting lines when HandPanel calls HandDetector.draw(). The update() method is essentially a series of calls that implement Figures 2 and 3.
update() begins by scaling the supplied webcam image to improve processing speeds. It then converts the picture into HSV format so it can generate a threshold image using the black glove’s HSV ranges. This corresponds to the first line of Figure 2, although the threshold is actually rendered as white pixels against a black background. The threshold, minus small specks, is passed to findBiggestContour(); the resulting contour is assumed to be the user’s hand in subsequent processing stages. extractContourInfo() analyzes the contour to find the hand’s center-of-gravity (COG), and its orientation relative to the horizontal, which are stored in the cogPt and contourAxisAngle globals. The completion of extractContourInfo() corresponds to the end of Figure 2. The findFingerTips() method wraps a convex hull around the contour to identify the shape’s defects (the top line of Figure 3), which we assume are the hand’s fingers. After a little filtering to reduce the number of defects, the remaining ones are treated as fingertip coordinates, and stored in the global fingerTips list. nameFingers() labels the fingers (assuming that the thumb and index finger are on the left side of the hand), completing Figure 3’s stages. findBiggestContour() uses the OpenCV function cvFindContours() to create a list of contours. For my binary threshold image, a contour is a region (or blob) of white pixels. Each blob is approximated by a bounding box, and the contour corresponding to the largest box is selected and returned. cvFindContours() can return different types of contours, collected together in different kinds of data structures. I generate the simplest kind of contours, storing them in a linear list which can be searched with a while loop. After some experimentation, I placed a lower bound on the bounded box size of 600 square pixels which filters out small boxes surrounding patches of image noise. This means that findBiggestContour() may return null if it doesn’t find a large enough box. The next step shown in Figure 2 is to find the COG and angle to the horizontal of the hand contour by calling extractContourInfo(). This is where the code in HandDetector starts to part company from the analysis carried out by ColorRectDetector.findRect() in chapter 5. In section 4.2 of that chapter, the enclosing box around the contour is utilized to obtain a center and orientation. This is adequate because the underlying shape is a rectangular card, and so the contour and box are almost identical. However, a bounding box around a hand can easily have a very different COG or angle from the hand itself; in this case, it’s necessary to directly analyze the hand contour rather than a bounding box, by utilizing moments. I used spatial moments back in chapter 3 to find the COG of a binary image. The same technique can be applied to a contour to find its center (or centroid). I can also calculate second order mixed moments, which give information about the spread of pixels around the centroid. Second order moments can be combined to return the orientation (or angle) of the contour’s major axis relative to the x-axis. The function takes two arguments, p and q, which are used as powers for x and y. The I() function is the intensity for a pixel defined by its (x, y) coordinate. n is the number of pixels that make up the shape. If I consider a contour like the one in Figure 6, then θ is the angle of its major axis to the horizontal, with the +y-axis pointing downwards. Figure 6. A Contour and its Major Axis Line. The extractContourInfo() method shown below uses spatial moments to obtain the contour’s centroid, and cvGetCentralMoment() to calculate the major axis angle according to the above equation; these results are stored in the globals cogPt and contourAxisAngle for use later. Moments in OpenCV are explained in depth in ‘Simple Image Analysis by Moments’ by Johannes Kilian at http://public.cranfield.ac.uk/c5354/teaching/dip/opencv/SimpleImageAnalysisbyMoments.pdf. The code inside calculateTilt() is based on the special cases for θ listed in Table 1 of Kilian’s paper. Unfortunately, the axis angle doesn’t distinguish between a hand with fingers pointing upwards and one facing down, and so it’s necessary to examine the relative position of the fingertips with respect to the COG to decide whether the angle should be adjusted. The problem is that this information isn’t available until after the hand contour’s convex hull has been examined for defects, which occurs after extractContourInfo() has finished. My solution is to use the fingertip coordinates calculated in the previous call to update() which analyzed the webcam frame before the current one. The data will be out-of-date, but the hand won’t have moved much in the 200 ms interval between snaps. Identifying the fingertips is carried out in the first row of Figure 3; in the code, a convex hull is wrapped around the contour by OpenCV’s cvConvexHull2() and this polygon is compared to the contour by cvConvexityDefects() to find its defects. Hull creation and defect analysis are speeded up by utilizing a low-polygon approximation of the contour rather than the original. 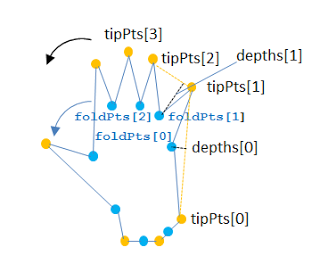 The latter half of findFingerTips() extracts the tip and fold coordinates and depths from the defects sequence. The earlier call to the convex hull method, cvConvexHull2(), with a CV_COUNTER_CLOCKWISE argument means that the coordinates will be stored in a counter-clockwise order, like that of Figure 7. Figure 7. Fingertips, Folds, and Depths. The fingertips are stored in a tipPts array, the finger folds (the indentations between the fingers) in foldPts, and their depths in depths. As Figure 7 suggests, the analysis often generates too many defects, and so reduceTips() is called at the end of findFingerTips(). It applies two simple tests to filter out defects that are unlikely to be fingertips – it discards points with shallow defect depths, and coordinates with too great an angle between their neighboring fold points. Examples of both are shown in Figure 8. Figure 8. Shallow Depths and Wide Angles. nameFingers() uses the list of fingertip coordinates, and the contour’s COG and axis angle to label the fingers in two steps. First, it calls labelThumbIndex() to label the thumb and index finger based on their likely angles relative to the COG, assuming that they are on the left side of the hand. nameFingers() attempts to label the other fingers in labelUnknowns(), based on their known order relative to the thumb and index finger. One of the possible finger names is UNKNOWN, which is used to label all the fingertips prior to the calls to the naming methods. labelThumbIndex() attempts to label the thumb and index fingers based on the angle ranges illustrated in Figure 9. Figure 9. 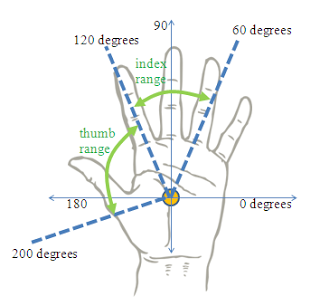 Angle Ranges for the Thumb and Index Fingers. The index finger can turn between 60 and 120 degrees around the COG, while the thumb can move between 120 and 200 degrees. I arrived at these angles through trial-and-error, and they assume that the hand is orientated straight up. labelThumbIndex() also assumes that the thumb and index fingers will most likely be stored at the end of the fingerTips list, since the contour hull was built in a counter-clockwise order. It therefore increases its chances of matching against the right defects by iterating backwards through the list. 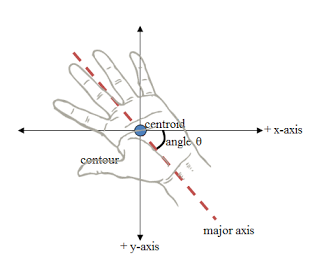 angleToCOG() calculates the angle of a fingertip relative to the COG, remembering to factor in the contour axis angle so that the hand is orientated straight up. labelUnknowns() is passed a list of finger names which hopefully contains THUMB and INDEX at certain positions and UNKNOWNs everywhere else. Using a named finger as a starting point, the UNKNOWNs are changed to finger names based on their ordering in the FingerName enumeration. labelPrev() and labelFwd() differ only in the direction they move through the list of names. labelPrev() moves backwards trying to change UNKNOWNS to named fingers, but only if the name hasn’t already been assigned to the list. 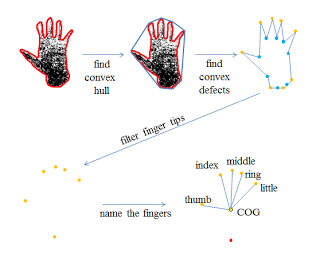 The analysis performed by update() will result in a list of fingertip points (in the fingerTips global), an associated list of named fingers (in namedFingers), and a contour COG and axis angle. 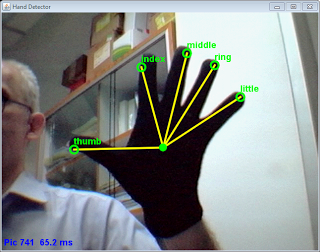 All of these, apart from the angle, are utilized by draw() to add named finger labels to the webcam image, as shown in Figure 1 and Figure 10 below. Figure 10. Named Fingers and an Unknown. An unknown finger ‘tip’ (labeled as UNKNOWN in namedFingers) is drawn as a red circle. The Handy application stops short at converting the named fingertips into gestures, which would require an analysis of how the fingers move through space over time. Preliminary tests show that Handy can only identify gestures reliably when they involve an outstretched thumb and/or index finger, perhaps combined with other fingers. Gestures of this type include ‘victory’, ‘wave’, ‘good’, ‘point’, and ‘gun’ shown in Figure 11. Figure 11. Gestures Suitable for Handy-style Detection. A common gesture that cannot be detected by Handy is ‘ok’ (see Figure 12) because it requires the fingers be brought together, which cannot be detected solely in terms of contour defects. Figure 12. The Unsuitable ‘ok’ Gesture. 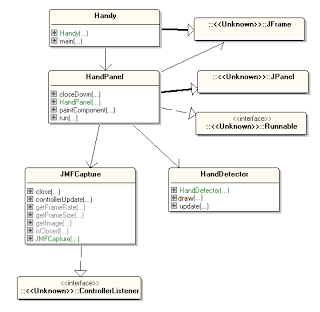 Reference: Hand and Finger Detection using JavaCV from our JCG partner Attila-Mihaly Balazs at the Java Advent Calendar blog. 44 Comments Views Tweet it! I tried to implement the code but getting problem in finding fingerTip. Please can you send me the same for reference. Can you please send the code to my email? Helpful tutorial.I need this project source code in opencv python.Can you help me?. It’s for my refrens on my last project at my university. Excuse me, I found the link above. Tks! Thanks a lot for your explanation please can you send project to my mail zunisattar@gmail.com.